Progress on site is on schedule and the 3D textbook is now being clad externally with a variety of finishes. All finishes have been selected with the project criteria in mind, ensuring reuse is at the forefront of the agenda and that natural and ecologically sustainable materials are used where reuse is not possible, either due to lack of supply or cost. The cladding will consist of a variety of materials including brick, galvanised steel and timber. The ground floor of the building will be clad in a variety of brick finishes. 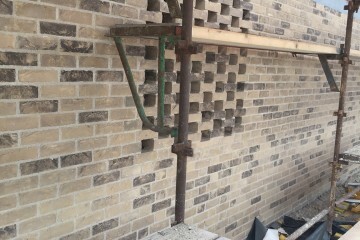 Both reused and new bricks have been utilised to highlight the differences in working with each type. Reused bricks are generally more inconsistent in terms of texture, colour and shape verses new bricks, however, they add a distinct visual identity to the building. 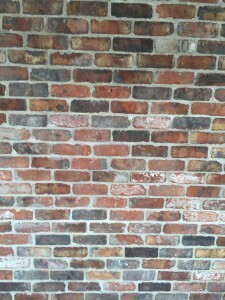 The reused bricks consist of salvaged Dolphin Barn yellow brick and salvaged Red Belfast brick which are arranged in different patterns and fixed using a lime mortar. The upper floor of the boiler house will feature both galvanised steel and timber cladding. 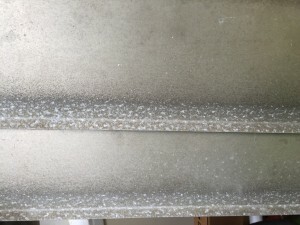 The galvanised steel cladding has been remade from the original boiler house louvres which were carefully removed from the boiler house at the beginning of the construction phase, thereby retaining an aspect of the original façade, if not in its original form. Unfortunately, a suitable source of reused or reclaimed timber could not be found in the allotted timeframe. The timber cladding will therefore consist of heat treated red deal which was chosen after an assessment of the available timber with respect to the project sustainability criteria. This variety of materials not only showcases reuse and sustainable materials but will also create an interesting and individual visual aesthetic to the exterior of the boiler house.